Toyota strongly urges that the driver andpassengers in the vehicle be properly restrainedat all times with the seat beltsprovided. Failure to do so could increasethe chance of injury and/or the severity ofinjury in accidents. The seat belts provided for your vehicleare designed for people of adult size,large enough to properly wear them. Child. Use a child restraint system appropriatefor the child until the child becomeslarge enough to properly wear thevehicle’s seat belts. For details, see “Childrestraint” on page 86. If a child is too large for a child restraintsystem, the child should sit in the rearseat and must be restrained using thevehicle’s seat belt. According to accidentstatistics, the child is safer when properlyrestrained in the rear seat than in thefront seat. If a child must sit in the front seat, theseat belts should be worn properly. If anaccident occurs and the seat belts are notworn properly, the force of the rapid inflationof the airbag may cause death orserious injury to the child. Do not allow any children to stand up orkneel on either rear or front seats. Anunrestrained child could suffer serious injuryor death during emergency braking ora collision. Also, do not let the child siton your lap. Holding a child in your armsdoes not provide sufficient restraint.Pregnant woman. Toyota recommends theuse of a seat belt. Ask your doctor forspecific recommendations. The lap beltshould be worn securely and as low aspossible over the hips and not on thewaist. Injured person. Toyota recommends theuse of a seat belt. Depending on the injury,first check with your doctor for specificrecommendations. Persons should ride in their seatsproperly wearing their seat beltswhenever the vehicle is moving. Otherwise, they are much more likelyto suffer serious bodily injury ordeath in the event of sudden brakingor a collision. Use the belt for only one person ata time. Do not use a single belt fortwo or more people—even children. Avoid reclining the seatback anymore than needed. The seat beltsprovide maximum protection in afrontal or rear collision when thedriver and the front passenger aresitting up straight and well back inthe seats. If you are reclined, thelap belt may slide past your hipsand apply restraint forces directlyto the abdomen or your neck maycontact the shoulder belt. In theevent of a frontal collision, themore the seat is reclined, the greaterthe risk of death or personal injury. Be careful not to damage the beltwebbing or hardware. Take care thatthey do not get caught or pinchedin the seat or doors. Inspect the belt system periodically.Check for cuts, fraying, and looseparts. Damaged parts should be replaced.Do not disassemble ormodify the system. Replace the belt assembly (includingbolts) if it has been used in asevere impact. The entire assemblyshould be replaced even if damageis not obvious. Adjust the seat as needed and sit upstraight and well back in the seat. 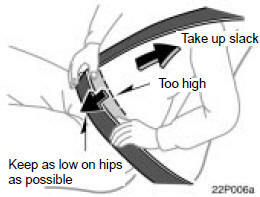 Tofasten your belt, pull it out of the retractorand insert the tab into thebuckle. You will hear a click when the tab locksinto the buckle. The seat belt length automatically adjuststo your size and the seat position. The retractor will lock the belt during asudden stop or on impact. It also maylock if you lean forward too quickly. Aslow, easy motion will allow the belt toextend, and you can move around freely. When a passenger’s shoulder belt is completelyextended and is then retractedeven slightly, the belt is locked in thatposition and cannot be extended. This featureis used to hold the child restraintsystem securely. (For details, see “Childrestraint” on page 86.) To free the beltagain, fully retract the belt and then pullthe belt out once more. If the seat belt cannot be pulled out of theretractor, firmly pull the belt and releaseit. You will then be able to smoothly pullthe belt out of the retractor. After inserting the tab, make surethe tab and buckle are locked andthat the belt is not twisted. If the seat belt does not functionnormally, immediately contact yourToyota dealer. Do not use the seatuntil the seat belt is fixed, becauseit cannot protect an adult occupantor your child from death or seriousinjury. Adjust the position of the lap andshoulder belts. Position the lap belt as low as possibleon your hips—not on your waist, then adjustit to a snug fit by pulling the shoulderportion upward through the latch plate. Both high−positioned lap belts andloose−fitting belts could causedeath or serious injuries due tosliding under the lap belt during acollision or other unintended event.Keep the lap belt positioned as lowon hips as possible. Do not place the shoulder belt underyour arm. Adjust the shoulder anchor position toyour size. To lower: Push in the lock release buttonand slide the anchor down. After adjustment, make sure the anchor islocked in position. Always make sure the shoulder beltis positioned across the center ofyour shoulder. The belt should bekept away from your neck, but notfalling off your shoulder. Failure todo so could reduce the amount ofprotection in an accident and causedeath or serious injuries in a collision. To release the belt, press the bucklerelease button and allow the belt toretract. If the belt does not retract smoothly, pullit out and check for kinks or twists. Thenmake sure it remains untwisted as it retracts. If your seat belts cannot be fastened securelybecause they are not long enough,a personalized seat belt extender is availablefrom your Toyota dealer free ofcharge. Please contact your local Toyota dealer sothat the dealer can order the proper requiredlength for the extender. Bring theheaviest coat you expect to wear for propermeasurement and selection of length.Additional ordering information is availableat your Toyota dealer. When using the seat belt extender,observe the following precautions.Failure to follow these instructionscould reduce the effectiveness of theseat belt restraint system in case ofan accident, increasing the chance ofdeath or serious injury. Remember that the extender providedfor you may not be safe whenused on a different vehicle, foranother person, or at a differentseating position than the one originallyintended. If the seat belt extender has beenconnected to the driver’s seat beltbuckle without wearing the seat beltwhen using the extender in thedriver’s seat, the SRS driver’s airbagsystem will judge that the driverwears the seat belt even if notwearing it. In this case, the driver’sairbag may not activate correctly,causing death or serious injury inthe event of collision. Be sure towear the seat belt with the seat beltextender. Make sure the “AIRBAG ON”indicator light is illuminated whenusing the seat belt extender for thefront passenger seat. If the“AIRBAG OFF” indicator light isilluminated, disconnect the extendertongue from the seat belt buckle,then reconnect the seat belt.Reconnect the seat belt extenderafter making sure the “AIRBAG ON”indicator light is illuminated. If youuse the seat belt extender while the“AIRBAG OFF” indicator light isilluminated, the front passengerairbag and side airbag on the frontpassenger side may not activatecorrectly, causing death or seriousinjury in the event of collision. Be sure to wear the seat belt withoutthe seat belt extender if youcan fasten the seat belt without theextender. To connect the extender to the seatbelt, insert the tab into the seat beltbuckle so that the “PRESS” signs onthe buckle release buttons of the extenderand the seat belt are both facingoutward as shown. When releasing the seat belt, press onthe buckle release button on the extender,not on the seat belt. This helps preventdamage to the vehicle interior and extenderitself. As far as the seat belt extender on thefront passenger side is concerned, do notfail to disconnect the extender from theseat belt after the above operation in orderto activate the front passenger airbagcorrectly when getting into the vehiclenext time. When not in use, remove the extenderand store in the vehicle for future use. After inserting the tab, make surethe tab and buckle are locked andthat the lap and shoulder portionsof the belt and the seat belt extenderare not twisted. There are seat belt pretensioners forboth front seats. They are designed tobe activated in response to a severefrontal impact. When the sensor detects a severe frontalimpact, the front seat belts are quicklydrawn back by the retractor so that thebelts snugly restrain the occupants. The seat belt pretensioner and SRS airbagsmay not operate together in all collisions. The seat belt pretensioner system consistsmainly of the following componentsand their locations are shown in the illustration. The seat belt pretensioners are controlledby the airbag sensor assembly. The airbagsensor assembly consists of a safing sensorand airbag sensor. When the seat belt pretensioners are activated,an operating noise may be heardand a small amount of non−toxic gas maybe released. This does not indicate thata fire is occurring. This gas is normallyharmless. Once the seat belt pretensioners havebeen activated, the seat belt retractorsremain locked. Do not modify, remove, strike or openthe seat belt pretensioner assemblies,airbag sensor or surrounding area orwiring. Failure to follow these instructionsmay prevent the seat belt pretensionersfrom activating correctly,cause sudden operation of the systemor disable the system, which couldresult in death or serious injury. Consultyour Toyota dealer about any repairand modification. Do not perform any of the followingchanges without consulting yourToyota dealer. Such changes can interferewith proper operation of theseat belt pretensioners in somecases. This indicator comes on when the “IG−ON” mode is enabled. It goes off afterabout 6 seconds. This means the seatbelt pretensioners are operating properly. If either front seat belt does not retractor can not be pulled out due to amalfunction or activation of the relevantseat belt pretensioner. The seat belt pretensioner assembly orsurrounding area has been damaged. The front part of the vehicle (shadedin the illustration) was involved in anaccident that was not severe enough tocause the seat belt pretensioners tooperate. The seat belt pretensioner assembly orsurrounding area is scratched, cracked,or otherwise damaged.